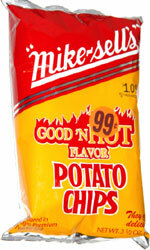 Taste test: These wide-rippled chips are fairly tasty and fairly hot, but they don't go far enough in either regard. So flavorwise, they're good, but far from great. 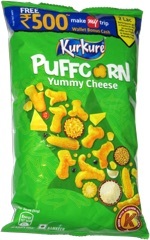 The underlying ripple chip is excellent: crisp, crunchy and strong. These were 2-year-old Robbie's introduction to hot chips, and despite his father's worries and objections when Robbie's uncle offered him these, Robbie enjoyed them quite a bit. Smell test: Mostly like paprika, but with some hot sauce mixed in. Trivia: These chips were consumed during perhaps the worst game in Boston Red Sox history, as they fell to the Yankees in Game 7 of the 2003 ALCS, blowing a 5-2 lead. What was Grady Little thinking leaving Pedro Martinez in for the 7th and 8th innings? We at Taquitos.net believed at the time that the bullpen had a far better chance to hold the 3-run lead.